The first step is to create a plaster mold from a water based clay sculpture. Oil based clays may produce slow or uneven absorption, resulting in low quality casting. If you insist on using oil based clays the plaster mold may be cleaned with rubbing alcohol or any common citrus degreaser followed by soap and water. The plaster mold must be dried before use. To speed up the drying, an oven set at 150°F may be used. When the mold is dried the seams must be sealed, using clay works very well. 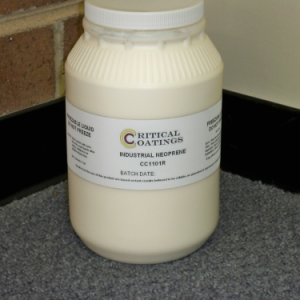 Pour your desired grade of Critical Coatings Neoprene into the mold. A good way to do this is to pour slowly and at an angle to reduce any bubbles. As the mold absorbs moisture a neoprene skin starts forming on the walls seen by the level of the Neoprene decreasing. Simply top off the mold with fresh Neoprene. The longer the Neoprene sits in the mold the thicker the “skin” or cast. Typically 2 - 5 hours is sufficient. Once the desired thickness of the cast is reached, the uncured Neoprene (in the mold) can be poured through a filter back into the original container and used for the next project. Use window screen as a filter for the product. Window screen can be purchased at local hardware stores. The cast must be left to drain and dry 10-14 hours at room temperature before removal. Again an oven at 150°F may be used, 2 - 4 hours. When the cast is no longer sticky to the touch, it can be removed. Upon removing from mold, an additional 24 – 48 hours is required for the cast to completely cure. If cast is still flimsy make sure you stuff it with newspaper to hold the form. You can then trim, sand, prime and paint your masterpiece.